42mm Rugged Armor Apple Watch Case TPU Shock Resist Waterproof for Series 3, Series 2, Series 1, Nike+ Sport Edition - Black by Zesmart at Kode Fu Guru. MPN: 4336698322. Hurry! Limited time offer. Offer valid only while supplies last. 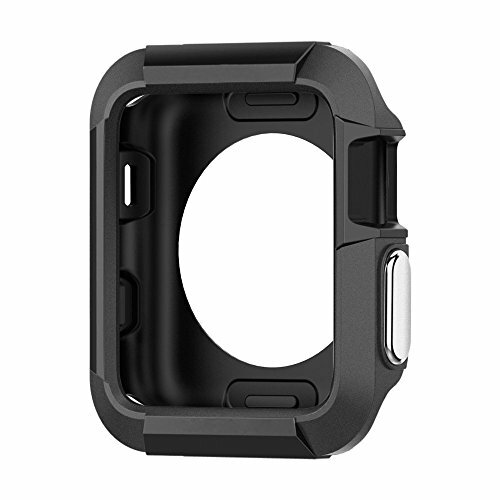 42mm Apple Watch TPU protective case shock resist waterproof for Series 3, Series 2, Series 1, Nike+ Sport Edition. Aluminum button, easy to press. All the mic /speaker holes fit perfectly. It's slim and adds to the look. Made of shock-absorbing TPU material, and it provides collision protection. Easy installation and stays securely on your watch, providing daily protection against bumps, drops, and scratches , etc. It's a the case, but a great protective rubber surround. And it can be used with screen protector. If you have any questions about this product by Zesmart, contact us by completing and submitting the form below. If you are looking for a specif part number, please include it with your message.